Florida moved into the AP Poll thanks to its win over Kentucky on Saturday in Lexington and improved to 6-1 in the SEC. This present an opportunity to play against the Gators which could easily be in letdown mode after that victory. Despite home games against Vanderbilt and Mississippi St., two of the lowest ranked RPI teams in the conference, this is the first time the Gators have been favored in the SEC by double-digits. The Gators are at a disadvantage in two important categories here as they are ranked last in the conference in three-point percentage defense (37 percent) and next to last in rebounding defense (36.8 rpg). The Gators are 0-4-1 ATS in their last five home games against teams with a winning road record. 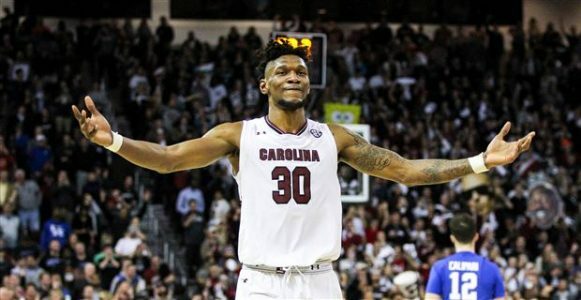 South Carolina is a much different team than the one that made the Final Four run a year ago, but the Gamecocks are more than holding their own. Last week, they picked up a big win over Kentucky and were on pace for another one against Tennessee but failed to hit a shot the final four minutes and lost 70-63. South Carolina is ranked first in the SEC in defensive rebounding percentage (76.2 percent), and second in scoring defense (65.5 ppg), rebounding defense (32.5 rpg) and offensive rebounding (12.7 rpg). Some are pointing to the Elite Eight victory by South Carolina last season over Florida as a motivator for the Gators here, there are only eight combined players from the two teams that were there. The Gamecocks are 9-4 ATS in their last 13 games against teams with a winning percentage above .600. After a PERFECT 7-0 CBB Saturday SWEEP, Matt went 2-1-1 on Sunday and Monday before producing another PERFECT SWEEP on Tuesday! He is now on an EPIC 12-1-1 CBB Run since Saturday and it has been incredible all season! He is on a 71-44-4 CBB Run the last 116 plays and overall, he is 74-49-4 +$20,419 in CBB this season!He is going for another SWEEP on Wednesday with THREE more Powerful Plays!